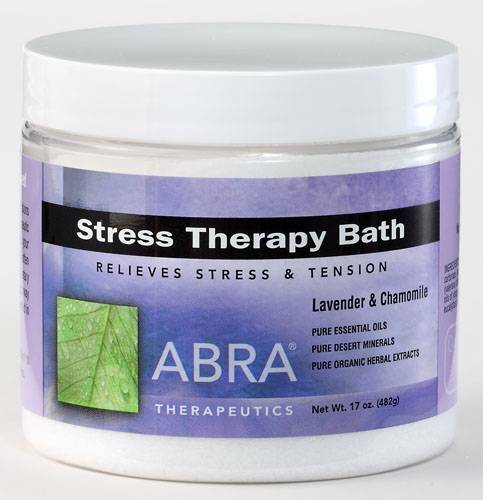 Stress Therapy Bath is used to relieve the body of stress, a major cause of illness and disease, with a blend of natural minerals and organic herbals lavender (lavandula officinalis) and chamomile (matricaria recutita). It is well known that stress is a primary cause of disease and illness. There are several ways to view stress. The body grows stronger when subjected to stress, for instance: weight resistance creates muscle density; exposure to adverse weather conditions builds adaptability, practicing public speaking builds confidence, etc. But too much weight, too harsh an environment, or too aggressive an audience can overwhelm a natural balance and actually create a condition detrimental to health. Most of us carry more stress than we know. It is generally found in muscle clenching and muscle contraction on a subconscious level. When you touch your friends shoulder muscles, are they tight? Is it because they were just working out, or are they still tense from an argument yesterday? Stress builds up on an unconscious level. Whatever the causes, a big bill, a road rage, a stubbed toe, it all ends up building stress throughout the body. This restricts the natural flow of fluids and nerve energy just like a kink in a garden hose restricts the water flow. The Stress Therapy Bath removes stress from the body. It appears to work both mechanically and psychologically to provide stress relief.